China as a whole has an excessive nature; bigger is better. This can be seen with the endlessly snaking wonder of the world, and the city centre holding the infamous Tiananmen square and the monumental structures that surround it. However when it comes to shear grandness, an amazing example of extravagant beauty. 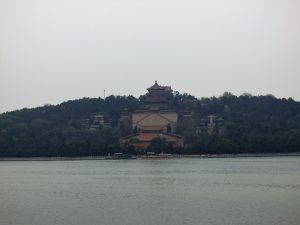 The Summer Palace boasts the title of the biggest and possibly most immaculate attraction in Beijing. 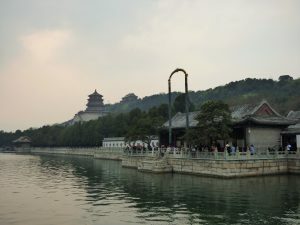 The Summer Palace provides the perfect getaway from the hustle and overall defending drone of Beijing. The city displays a modern battle between the metropolis expansions both laterally and horizontally, and the peaceful spirituality and incomparable culture from which China rose to glory. 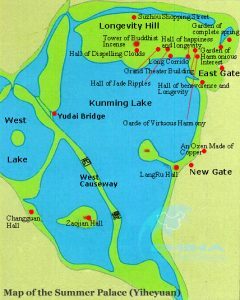 Due to the Summer Palace’s monumental size, the park limits are spread far across the North-West of the city (Haidian District), there are a number of entrances which are provided. 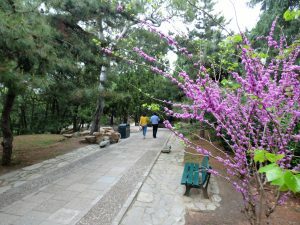 Much like every other highlight spot in Beijing, its easily accessible by subway, providing a number of possible options. There are actually 3 possible points of entry, each with their own subway stop. 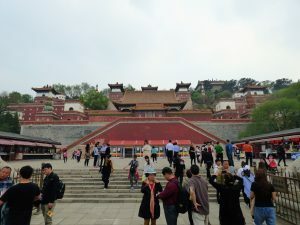 For the North Palace Gate, take line 4 to Beigongmen exit D, and head west. Otherwise, West Palace Gate is found if you take line 10 to Bagou then taking the Western Suburban Line to Yiheyuanximen before heading north. Last option is the East Palace Gate along either line 4 or line 16 to Xiyuan exit C2 and head west. Entrance fees will vary depending on the time of year and what exactly you want to see while you’re inside. China has the habit of charging for admission into certain buildings and area’s for somewhere you’ve already paid to enter. A “combo ticket” at 60 RMB (50 RMB between Nov-Mar) covers everything including entrance to the Buddhist Tower of Incense and Suzhuo Street. Otherwise you’ll have to pay for them individually. From the northern entrance, this is the first welcome site, and a peculiar one at that. 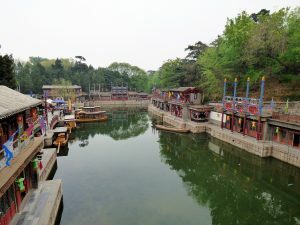 You’ll arrive at a beautifully designed bridge that crosses a small greenish moat lined with little stereotypical souvenirs stores along the waters edge. Welcome to Suzhou Street. 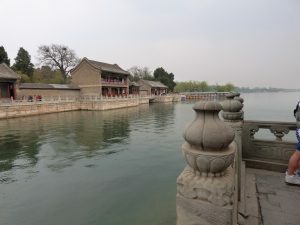 The moat was originally built to resemble the waterways and canals of the city Suzhuo for a homesick member of royalty. Along with merchants selling overpriced souvenirs, there are some spectacularly designed boats which offer rides for a price. This thrilling ride extends all of 300 meters or so. Even admittance to the street itself comes at a price, 10 RMB. Definitely an interesting detour from the regular decor in the rest of the park grounds. 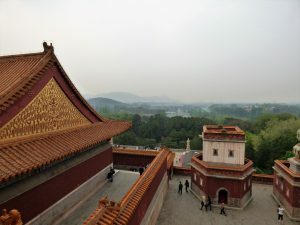 Following the bridge over Suzhuo Street you’ll arrive at the top of a stairway to the ominous dominating figure of the Four Great Regions clasping spectacularly across Longevity Hill. Here you’ll be exposed to the first of many varying styles throughout the grounds of the palace. 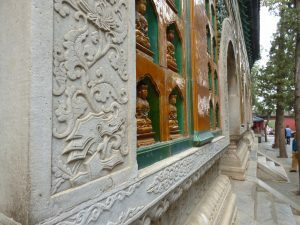 The Four Great Regions displays Tibetan architecture mixed with more traditional Chinese design. As is the name of the very hill, do expect a demanding trek up countless amounts of steps. This in the humid climate becomes more of a challenge than an attraction. 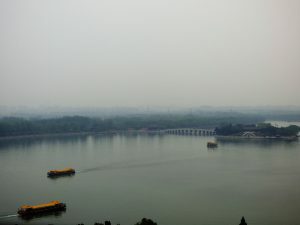 Scale the 60-meter-tall mound created from the excavation of earth to create the enormous Kunming Lake. Scaling the Hill will also provide a nice opportunity to look back into Beijing. You’ll be able to spot the distant concrete jungle cushioned by a blanket of greenery. Depending on smog levels, it might even give an eerie view. 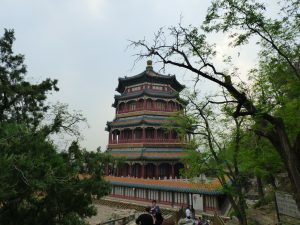 The mighty Tower of Buddhist Incense, perhaps the centrepiece of the Summer Palace, can be seen from miles around the enormous lake as it straddles the top of Longevity Hill. 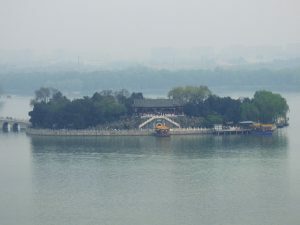 This is arguably the most associated image of the Summer Palace. It stands as a shining example of immaculate Chinese architecture and design that we might come to expect. The three-tiered structures comes straight out of Bruce Lee’s game of death, fitting our stereotypical image of Chinese structures. Within the tower itself you’ll find yet another extraordinary dedication to the Buddha, perhaps the most spectacular of the lot. Standing at 5 meters tall the Thousand-Handed Buddha sits within his beautifully designed residence. From here you’ll also have the opportunity (possibly) for the best view of the lakes entirety and the streets of Beijing in the near distance. Not many other places through the park provides such a panoramic view of the city. Sadly your quality of view will depend on the quality of the air that day. It at least provides a alternatively eerie scene, and almost able to loose site of the city’s grip. 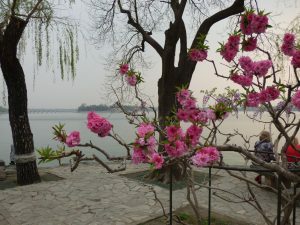 Before hitting the much-anticipated lake, you’ll have a pleasant walk through the tranquil forests lined with rose-blossoms and miscellaneous structures down towards the Lake’s edge. Here you’ll pass the Hall of Joyful Longevity adorned with bronze phoenixes and dragons. The positions of these mythical creatures are significant. The phoenix (representing the empress) takes the central position over the dragon (representing the emperor), demonstrating the power and respect she received. This hall served many purposes over the years, largely as residence for members of royalty. The hall was originally built by a Qing dynasty emperor for his mother on her 60th birthday, aww. 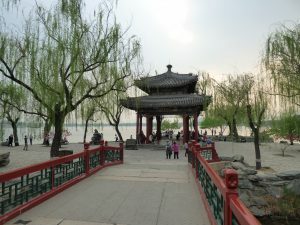 From the entrance to the Tower of Buddhist Incense onward, Kunming Lake will have the role as the centrepiece and the pivot for the rest of the Palace grounds. From all around the lake provides a stunning panoramic view from all angles (if the smog isn’t too bad). 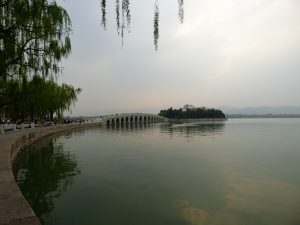 The cherry on top of the Kunming Lake cake is undoubtedly the tiny little picturesque South Lake Island placed precariously and connected with a monumental bridge. On the Eastern side of the lake you’ll find a range of sites to preoccupy. The lakes banks have a series of narrow walkways that wiggle their way around the edge. Further along the path opens up, opening the way for more merchant stalls, pedalo rentals and various attractions lining up the way towards South Lake Island. 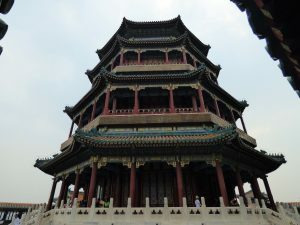 The lake-side also provides one of the best opportunities for a close-up look back at Longevity Hill in all its spectacularly designed glory. Along with fixed attractions with boat rentals and souvenir stores alike, there are also travelling attractions, namely water calligraphers. 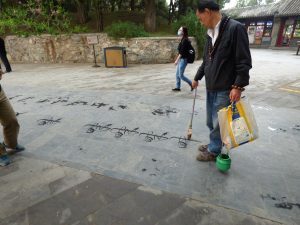 The slowly sway backwards decorating the paving stones with delicately drawn Chinese characters with his oversized brush. Along the lake-bank you’ll find the Heralding Spring Pavilion, a perfect stop worth your attention situated along the lake-side. This beautiful little island provides a peaceful and tranquil resting point, perfect for taking a minute to absorb and and sit in awe at the panoramic views around the lake. Here you’ll have an equally stunning views of South Lake Island as well as Longevity Hill. 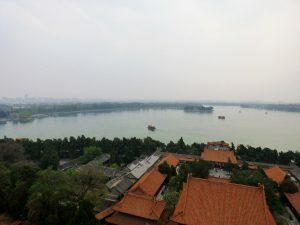 The mystical tiny South Lake Island situated in the middle of Kunming Lake and connected by a marvellously designed bridge of divine proportions. 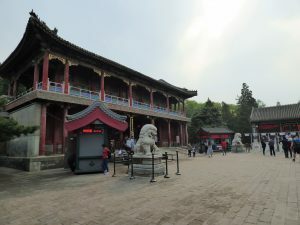 The island itself holds a few more treats, which would include the Hall of Embracing the Universe, which would have been used by royalty to gaze into the starry night sky and ponder. The island also provides the perfect shot of the Longevity hill and everything that adorns it. This will also be your opportunity for a closer look at the immaculately designed bridge seen from everywhere around the lake. 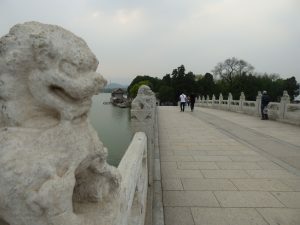 The bridge worthy of a connections to the heavens in a 150-meter-long arching bridge, which is lined with hundreds of lion figures.